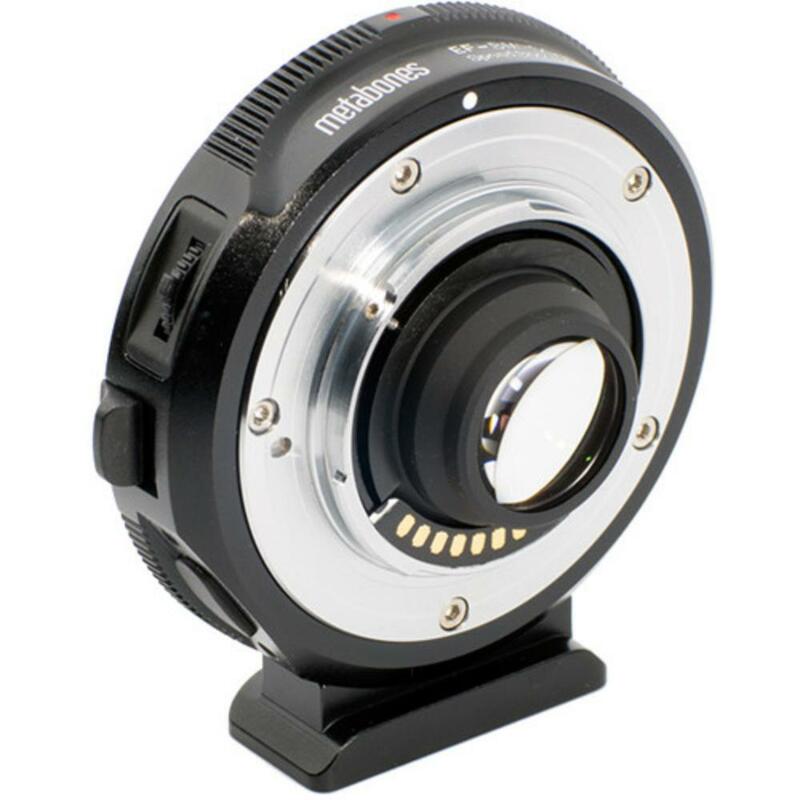 The Metabones Canon EF Lens to Blackmagic Pocket Cinema Camera T Speed Booster allows you to pair Canon EF mount lenses with the Blackmagic Pocket Cinema Camera and increases the effective field of view and the maximum aperture of the lens you're using. This is handy for achieving wider views with more dramatic depth of field effects on what is otherwise a sometimes uncompromising camera sensor due to its small Micro Four Thirds size. The Speed Booster works by shrinking the image circle of your Canon EF lens down to better fit the smaller sensor of the Blackmagic Pocket Cinema Camera. This has the effect of making the field of view of the lens 0.58x wider or, in other terms, reducing the crop factor of the camera from 3.02x to 1.75x. For example, your Canon 85mm f/1.2L becomes an effective 49.3mm with this Speed Booster, which renders a view equivalent to 148.9mm in 35mm full frame terms. This is close to the APS-C view of 136mm for this particular lens example. Your Blackmagic Pocket Cinema Camera will read less like a Micro Four Thirds sensor and more like the larger APS-C sensor thanks to this Speed Booster, plus you have the benefit of using a wide variety of Canon EF lenses while retaining lens AF (from firmware v2.1) and image stabilization (see Notes tab for more info on lens compatibility). By concentrating the image circle from a lens, this Speed Booster also "brightens" the image – maximum lens apertures are increased by 1 and 2/3rd stops. As an example, this yields a maximum aperture of f/0.74 when using a Canon 85mm f/1.2L. This Speed Booster is powered by the camera body, so no additional power supply is needed. To reduce the drain on your camera's battery, it uses an efficient switched-mode power supply, which continually switches between on and off states and only draws power when it needs it. The Metabones Canon EF Lens to Blackmagic Pocket Cinema Camera T Speed Booster is a great tool for those using the Blackmagic Pocket Cinema Camera who want to also use a large selection of Canon EF mount lenses while getting that added benefit of a "boost" to both field of view and maximum aperture. 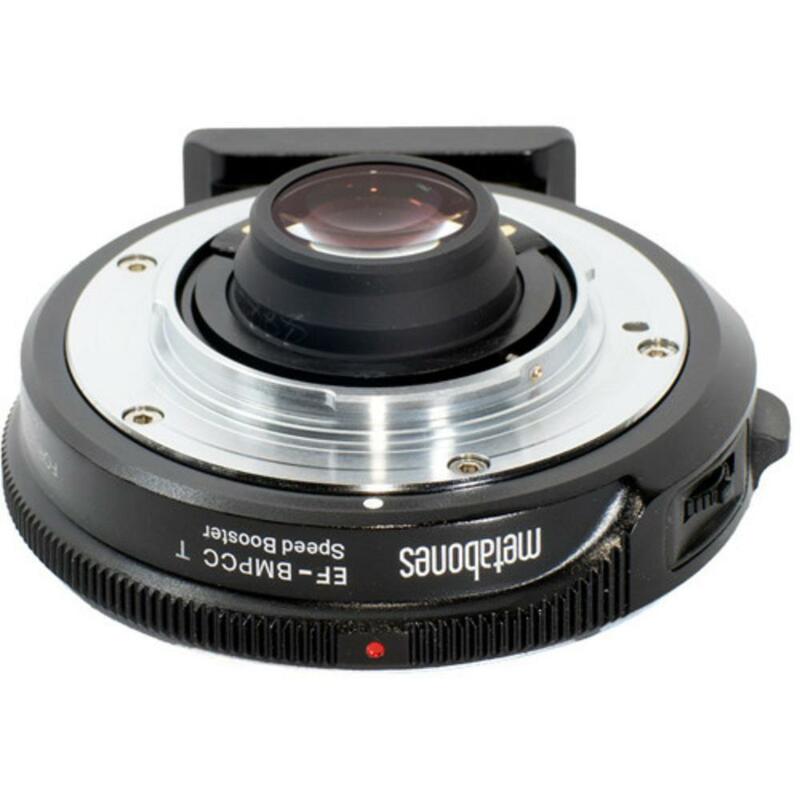 • This Speed Booster is compatible only with the Blackmagic Pocket Cinema Camera in Micro Four Thirds mount. It is not compatible with other Micro Four Thirds mount cameras, like the GH5. • When using lenses with apertures faster than f/1.8, the pre-boost apertures will be displayed in the camera. For example, it won't show f/0.7 with a f/1.2 lens attached. It will show f/1.2. The widest aperture where you'll see a boost displayed is f/1.8 (which will show f/1.0). The "boosting" is still occurring, it just doesn't show it on read-out for these ultra-fast lenses. • While technically compatible with any EF mount lens, please take notice if your third-party lens has any mount protrusions, like spikes or levers. These will damage the Speed Booster. • Autofocus is supported with this Speed Booster (from firmware v2.1) but with the following limitations: lack of support for Continuous AF, Flexible AF, and Video AF (technically works but will hunt a lot more). • If you are attempting to pair both a Canon lens with a Canon extender to this Speed Booster, autofocus is disabled if the combined maximum aperture of the lens and the extender is f/5.6 or smaller (higher number). • With STM lenses or a lens using electronic manual focusing, such as the Canon 85mm f/1.2L II, manual focus needs to be enabled on the camera body. • Do not try and pair APS-C lenses with this Speed Booster. It is designed specifically for adapting a lens' full frame image circle to that of the Micro Four Thirds sensor in the Blackmagic Pocket Cinema Camera. 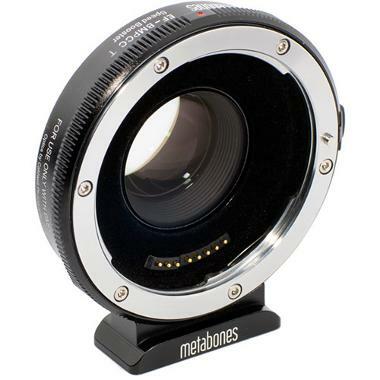 APS-C lenses start with an image circle too small for this to be as effective with this Speed Booster. Also, you run the risk of the rear element of the APS-C lens hitting the element inside the adapter. • This Speed Booster will technically mount to the Blackmagic Micro 4K Studio Camera but it is reported to be tight fit and performance varies. Experiment at your own risk! Special Note: The Tamron SP 17-50mm F/2.8 XR Di II VC Lens is not compatible with this Speed Booster.